Hey, take a look at this great nonprofit webinar Free Webinar: How Your Nonprofit Can Get $10K Per Month In Free Google Advertising at CharityHowTo! FYI: You must be a registered nonprofit (501c3 if based in the US) to be eligible for Google Grants. *Government entities, hospitals & schools are not eligible*. As a nonprofit, have you ever wanted a six-figure marketing budget without the six-figure price tag? Google Grants gives nonprofits $10,000 per month in free online advertising to promote their organizations and causes on Google search results. If you think it would be valuable for your nonprofit to be listed at the top of the search results, this webinar is for you! During this information-packed webinar, Simon Choy, founder of ConnectAd - who manages over $2M in annual Google Grants funding - and David Ries, Business Development Representative at ConnectAd, will tell you everything you need to know about the program, how it can benefit your nonprofit, and the actual process of applying for the grant. Simon and David will also highlight a few best practices and inside tips when using Google Grants and tell you about a professional service that is proven to help nonprofits effectively maximize the value of their Ad Grant. Why is Google Grants an essential nonprofit marketing tool? Case studies: How other nonprofits have benefited. Step-by-step details of the application process. What is required to succeed with Google Grants? Details about a professional service that manages Google Grants to save you time and provide an amazing ROI. Nonprofits big and small have a lot to gain from Google Grants, and we’ve been told by many organizations that it’s like leaving free money on the table when they don’t take advantage of the opportunity. Donors, volunteers, and supporters alike who use Google to search online can now be reached and engaged using your Google ads, and Google Grants can be used to tackle marketing problems such as raising awareness, growing online donations, building email lists, increasing volunteer registration, selling event tickets and much more. Simon Choy, founder of ConnectAd, helps charities obtain and manage free advertising through Google Grants. His expertise in the program has led to a 100% application success rate and he currently manages over $2 million in annual grant funding that generate more than 35 million ad views each year. He is also certified by Google as an online advertising expert and regularly blogs as a thought leader on Google Grants. 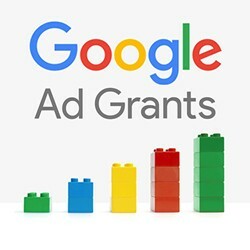 David Ries, a Business Development Representative at ConnectAd, assists with the assessment and strategy process for nonprofits to get started with the Google Ad Grant opportunity. He talks with dozens of nonprofits each month about their needs and how to determine the best fit for their operation with both short-term and long-term goals using the free $10K/month in AdWords. His background in exclusively the startup & nonprofit sector allows him to understand how to add value to nonprofits and increase their digital presence.